Whether a natural event turns into a disaster depends on the severity of the hazard as well as the condition of the social sphere of its potential victims, i.e., vulnerability. We focus on regional vulnerability considering the fact that regional socioeconomic conditions determine the aspects of the damage and thus the risk management policy. This book provides the theory and methodology to understand and cope with regional vulnerability through an interdisciplinary approach. The fields mainly included in this work are welfare and environmental economics, the planning and management area of civil engineering, and risk management. In particular, we focus on hazard and vulnerability surrounding water issues and provide readers with knowledge of how the regional analysis is incorporated into the vulnerability analysis. Also considered is what risk management should be when the diversified regional background of the vulnerability is taken into account. 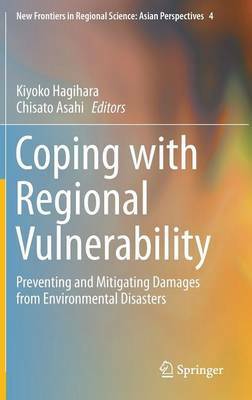 A feature of this book is that it provides contrastive regional coverage: the vulnerability of a developed country-urban and regional areas of Japan-and that of a developing country, Bangladesh. The contents consist of three parts: (1) Socioeconomic Vulnerability in a Regional Perspective, (2) Evaluation of Regional Vulnerability, and (3) Coping with Regional Vulnerability. This book is highly recommended to researchers who need an up-to-date and interdisciplinary approach to deal with risk management where regional vulnerability plays an important role.